Further to my PC Musician feature concerning Windows XP Tweaks in last month's SOS, you may remember that, as an experiment, I carefully disabled a total of 46 Windows Services on my music partition, according to a list provided by a well-known commercial builder of music PCs. This effort resulted in absolutely no change in CPU overhead, a fairly insignificant release of just 8MB of system RAM and no measurable improvement in song performance, confirming my opinion that tweaking Services is a pointless exercise. I also warned of possible instability as a result of tweaking Services. Well, I left my super-clean music partition with these tweaks in place, and during the next week found time for several long sessions working on some of my own songs. While my music applications all booted up correctly and seemed to run as before, during each session I experienced a number of infuriating crashes, particularly with Gigastudio 3, and I eventually found a sequence of actions that would crash the Gigapulse reverb window every time, with an application error that required a reboot. Cubase SX 3 seemed less affected, although on the second session it also crashed badly (previously a rare occurrence on my PC). Fortunately, I'd created a hard drive image immediately before the Service tweaks, so I could restore my partition to its previous state. As soon as I did so, my application crashes disappeared, and I was once more able to work with Cubase SX rewired to Gigastudio over an eight-hour session, without any bad behaviour at all from my PC. So let me reiterate my previous advice from last month's feature: "Disabling various Windows Services in an effort to further streamline your PC's audio performance is, in my opinion, pointless. Moreover, if you don't know exactly what you're doing, your system can become unstable or even refuse to boot up afterwards." Let me now add to this that even if you do know what you're doing, and carefully follow a list published on the Internet, you can still end up with an unstable PC. Just say no to Service tweaks! New plug-in keeps you in the groove: Basslane, from developer Otium FX, is a freeware VST plug-in for PC that should interest anyone who's having their tracks pressed to vinyl, or is simply concerned that the bottom end of their music lacks definition. It's a low-pass filter that lets you collapse the stereo width of all frequencies below a user-defined threshold down to mono, to prevent the stylus jumping out of the vinyl groove. If you want to ensure that your tracks are vinyl-compatible, run them through the freeware Basslane, which collapses bass frequencies below a certain threshold to mono. Many musicians are also convinced that content below about 300Hz should be mono, to retain low-end punch. At the mixing stage you can simply pan your basslines and kick drums to the centre, but Basslane is a handy tool for letting you hear the difference on a track in progress, and it's even more useful if you're presented with a pre-mixed track for mastering that has wide bass. Of course, the harmonics of the affected instruments may extend higher than the filter cutoff and remain in stereo, but you can audition the 'before and after' effects of the treated part of the spectrum to check. Freeware made easy: After a three-year gap, Mark Hadley's Databaseaudio web site is finally up and running again, with its incredibly comprehensive lists and links to freeware music applications, plug-ins and instruments. The majority are for the PC Windows platform, although there are some for PC Linux and Mac. Each of the hundreds of one-line entries contains just enough information to whet your appetite, and they are displayed 20 to a web page, making quick scanning very convenient. You can also view the contents sorted by Name, Developer, Most Popular, or via a set of relevant categories. I always found this site incredibly useful in the past, and I'm well pleased to see it back in circulation. SX by the book: Steinberg's Cubase SX PDF manual is certainly comprehensive, but it could never really be described as a good read. So given the number of SX queries we get on the SOS PC Music Forums, I can thoroughly recommend Simon Millward's excellent Fast Guide To Cubase SX book, whose third edition has just been published by PC Publishing (ISBN 1 870775 98 8) at £19.95. Although it weighs in at a massive 476 pages, Simon makes its contents extremely digestible, with plenty of practical advice and suggestions covering everything from setup, MIDI and audio recording, editing, effects, processing, mixing, mastering, automation, surround sound and the tempo track, to synchronisation with other gear. This latest edition also covers the new features of Cubase SX 3, as well as featuring all sorts of revisions and additions liberally sprinkled throughout the text. I've already experienced several 'well I didn't know that' revelations that have streamlined my Cubase experience. Highly recommended! This month I also had an incredibly frustrating experience while attempting to install a new USB peripheral, so just in case it ever happens to you, here are the gory details. Interested in on-body printing of CD-R disks, I ordered a Canon PIXMA iP4200 USB 2.0 printer — a bargain at £60 including VAT (although printer cartridges for it are expensive). I fitted the print head and a set of ink tanks, and then followed the driver installation instructions to the letter, only plugging in and then switching on the printer when asked (to bypass Window's own 'New Hardware Found' regime). 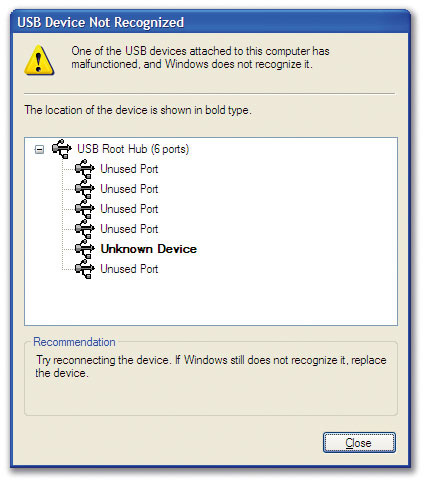 However, as soon as I did so, up popped the Windows message 'USB Device Not Recognised (one of the USB devices attached to this computer has malfunctioned, and Windows does not recognise it'. If you ever see this error message when you plug in a USB peripheral, don't assume it's faulty — it may be your choice of USB port that's causing a problem.I replaced the USB cable, just in case it was faulty, but there was no change. I then plugged the printer into another spare USB port, still with no success. Just in case both these USB ports were faulty, as a test I plugged a USB memory stick into them, which worked perfectly. I followed all the fault-finding advice in the Canon PDF manual, but the printer stubbornly refused to be recognised. At this point I was almost convinced that the printer must be faulty, but I persevered, and tried installing its drivers on my laptop. Success! The printer was recognised first time and printed test pages perfectly. Back on my desktop PC, I reorganised my other USB peripherals so that I could try the printer in yet another port, and this time it worked perfectly, but still refused to work in the first two ports I'd tried. The only difference was that the port that worked was a captive one mounted on the motherboard, while the two that didn't were on a backplate attached to one of the motherboard's headers via a short internal cable. Bizarre! At this point I remembered some similar behaviour a year or so ago, when a different USB memory stick wasn't recognised at all when plugged into my desktop PC's backplate USB ports, but worked perfectly on my laptop. 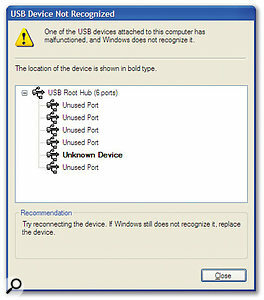 Armed with this new knowledge, I plugged the stick into a captive desktop USB port and it too was recognised! Given that this USB backplate assembly was bundled with my Asus motherboard and consists of just a few inches of ribbon and no active components, I found it very surprising that its ports don't provide performance identical to the other USB ports. However, you have been warned: if you ever encounter problems with a new USB device not being recognised at all, or being recognised and declared faulty, make sure you try a captive port before throwing in the towel. Unfortunately, my relief was short-lived: my new USB printer still wouldn't print CDs properly, so it had to be sent back for a replacement. The only reassuring thing to come out of the whole sorry affair is that I can recommend the company I bought the printer from, for their professional tech support and their prompt and efficient returns policy. Take a bow Scan (www.scan.co.uk), whose employees had no idea who I was, or that I'd reviewed one of their music PC systems in SOS. I notice plenty of musicians claiming that their audio interfaces manage a latency of 1.5ms, when the true figure is closer to 3ms. The reason for this confusion is that the 'real world' latency not only includes the interface buffer but also the delays due to A-D and D-A converters, plus any overhead caused by extra DSP functions or buffers on the interface. If you send a short audio pulse from your PC sequencer to your audio interface output, through an audio loopback cable connected between its analogue output and input, and then back in through the audio interface inputs, you can measure the round trip, as I described in SOS September 2002. However, a new utility from Centrance automates the whole process, making it far quicker and less prone to user error. 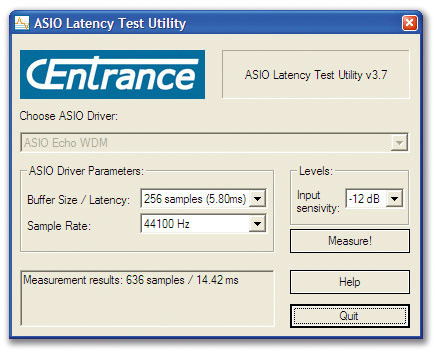 This handy ASIO Latency Test Utility (LTU) is a free download from their web site (www.centrance.com/products/ltu). 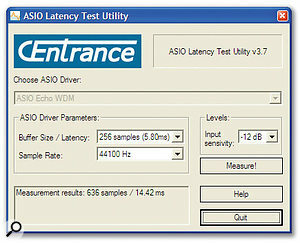 Download this handy utility from Centrance and you can measure the 'real-world' latency of your audio interface. Here's a typical example, where the buffer size/latency of my Echo Mia soundcard is reported at 5.8ms inside software applications but the expected 11.6ms output/input round trip actually measures 14.42ms, due to converter and DSP extras.Centrance claim accuracy within 0.5ms, but I found that my audio interfaces provided very repeatable results often to single-sample accuracy. Once you've chosen a buffer size and sample rate, and clicked on the Measure button, you can subtract twice the buffer size from the result to reveal the 'extras', which should be independent of buffer size. For instance, with a buffer size of 264 samples (6ms at 44.1kHz) my Emu 1820M measured a path length of 628 samples (14.24ms). After subtracting twice the buffer size from this total, to remove the input and output buffer contributions, you end up with a fairly typical 100 samples (2.2ms at 44.1kHz) for 'extras'. This, to all intents and purposes, is your 'zero'-latency delay (zero-latency monitoring connects the output of the A-D converter internally to the input of the D-A converter). So far, such results may seem largely academic, but other interfaces may reveal more interesting facts. For example, the extras on my Echo Mia measure 125 samples (2.83ms at 44.1kHz), which, as I explained in SOS October 2002, comprises 31 samples for the A-D converter, 30 samples for the D-A converter, and a hidden 32-sample DSP buffer on both outward and inward journeys, for PCI-buss efficiency. Some interface manufacturers are quite open about such hidden buffers. RME, for instance, employ a 64-sample 'safety' buffer (which would add just 1.45ms at 44.1kHz) on their Fireface, to ensure smooth playback. This is because, in contrast with PCI soundcards, Firewire interfaces lack DMA (Direct Memory Access) support. However, other manufacturers don't reveal such information, so it's quite possible that an interface that musicians find they can run successfully with a 64-sample buffer size does so because it has extra DSP buffers on the interface itself, that more than double the true latency. Of course, the most important thing is to have a rock-solid interface, but such techniques do mislead the average musician, which is why I intend to use the Centrance LTU to reveal 'hidden extras' in my future interface reviews.